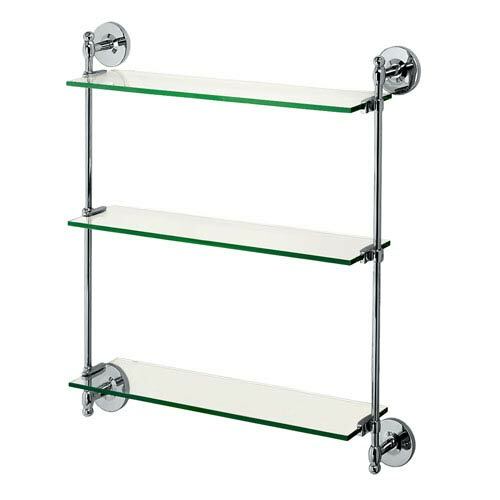 We carry a wide range of bathroom wall shelves and racks to suit small, medium and large spaces alike. Even better, these storage solutions effortlessly complement your interior design. 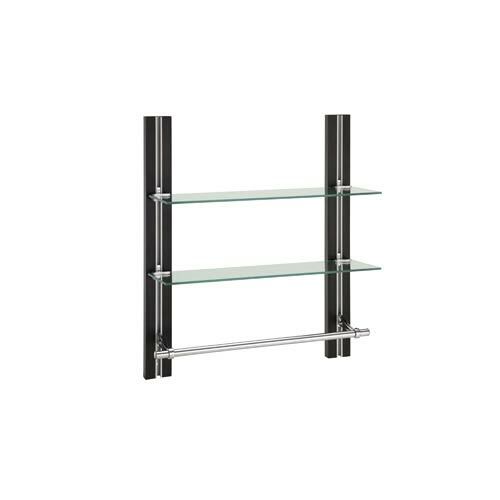 Whether you love cool, clean tones like glass bathroom shelves with polished nickel and chrome finishes, or prefer a rich touch of polished brass or oil rubbed bronze, these bathroom shelves organize your toiletries and elevate your personal sense of style. Clear glass bathroom shelves are a versatile addition to any modern space, while art deco bathroom shelving adds vintage-inspired details and plenty of charm. These practical accents suit transitional, contemporary, traditional and modern spaces with ease, and they’re available in both wall-mounted bathroom shelves and drill-free storage racks. Some of the simplest ways to add a bathroom rack or bathroom shelving to your space without drilling holes into your walls is with spacesaver units, corner shelves and over-the-door storage solutions. Spacesaver designs make excellent use of the unused vertical space directly above your bathroom toilet. Many of these styles feature a built-in bathroom shelf with towel bar construction for additional organizational and decorative opportunities. Alternatively, over-the-door baskets and storage cubbies allow you to discreetly store your towels and toiletries. Use them over linen closet doors to keep everything you need close at hand. Corner shelves further enhance tight spaces with their functional storage and angled fit. All of these options work to keep your walls hole-free (and your bathroom organized to your liking). The best bathroom shelving for your home will depend on the size and layout of your bathroom as well as your storage needs and personal sense of style. Choose a chrome and glass bathroom shelf or a brushed nickel shelf for versatility that works with a wide range of interior design schemes. Prefer contrast? Try a wall-mounted bathroom shelf in oil-rubbed bronze for an alternative finish that stands out against most bathrooms’ bright whites. Two-tier shelves allow extra space for your bathroom essentials, while curved bars and railings add elegance to your bathroom displays. Browse our full collection of bathroom wall shelves for additional styling inspiration. Q: What are some good bathroom shelving options for small spaces? A: Small bathrooms can still be big on organization and style. Corner shelving fits into tight areas and affords extra storage space for your essentials, while over-the-door shelving and tiered units let you maximize your vertical wall space. Bath caddies and small shower shelves can also create a tidy presentation for toiletries. Q: Are all bathroom racks and shelving wet rated? A: Not all bathroom racks and shelving systems are wet rated, so always double-check an item to make sure an item’s suitable for damp spaces. Some shelves are interior dry rated instead, which means that they can be used in an indoor area that’s not normally subject to dampness. These are oftentimes used in ventilated locations that are subject to temporary dampness, because the ventilation helps prevent the accumulation of moisture. Q: What materials last the longest for bathroom racks and shelving? A: Chrome and stainless steel are both common materials used in bathroom shelves and racks, and they add a touch of shine to your shower space. Ceramic shelves are also a popular choice, and they go well with retro interiors. Tempered glass is a particularly versatile addition to any bathroom interior. Essentially safety glass, it’s able to withstand thermal variations and is stronger than traditional glass. Q: Is assembly required for bathroom racks and shelving? A: Some bathroom racks and shelves do require some assembly or full assembly. For instance, certain bathroom shelves include wall-mounted hardware for secure hanging. 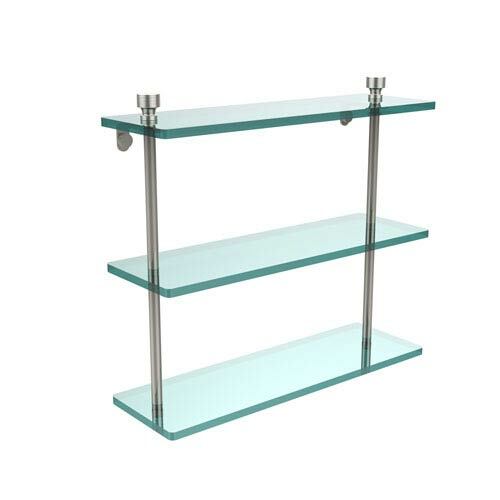 Others may require connecting the shelves to wall frames or assembling freestanding corner units with necessary hardware. Of course, the necessary assembly instructions will depend on the specific product.